Stay fully informed and in control throughout the entire contract lifecycle. 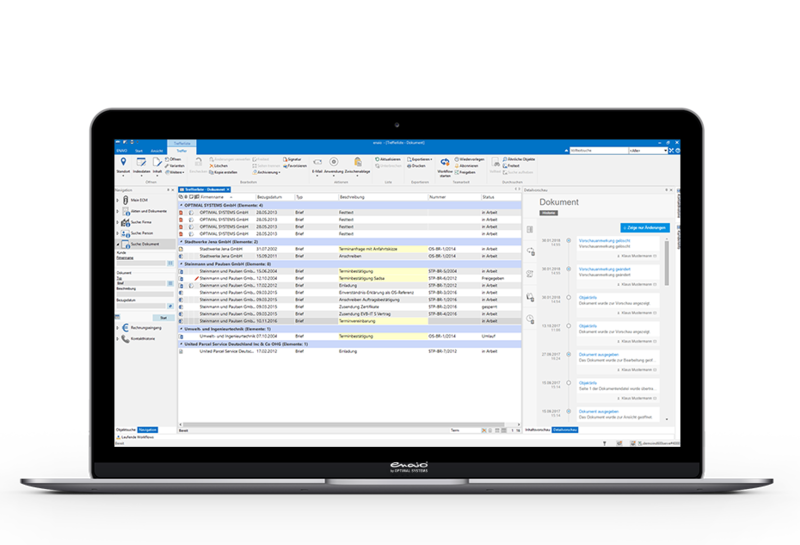 enaio® enables you to aggregate all contract information centrally and provides functions for managing it efficiently. This applies in particular to all existing purchase, service, rental, or lease contracts as well as the total costs of concluded contracts – with a simple solution that has been tried and tested in practice. Proven functions that have been successfully used by our customers for years. Plenty of room for targeted expansions and implementation of your own ideas. Comprehensive protection of your contracts and data thanks to a granular rights system. Easily manage your contracts in a contract record. A follow-up function supports your deadline management. The contract record always holds the current contact data of the contract partner, and workflows ensure seamless processes. Digital contract records in enaio® are not only used for the administration of contracts; they accompany all contract documents from creation to contract termination and beyond. This means that you have a complete overview of important contract-relevant information throughout all stages of the contract management process. 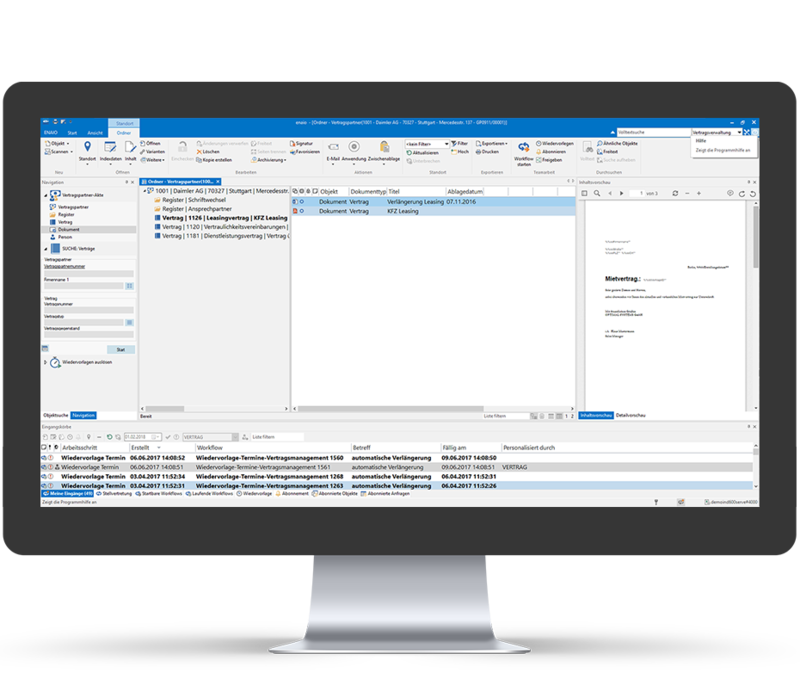 You can also easily create business documents and rest assured that business processes are logged accurately – from classification and adherence to deadlines and dates to the integration of external contract parties and subsequent audit-proof archiving. Our electronic contract record can be implemented into an existing IT structure quickly and easily. Contract management and processing does not get any simpler than this. Inclusion of mandatory information such as contract type, responsibili­ties, etc. Every company is different, just like every contract. 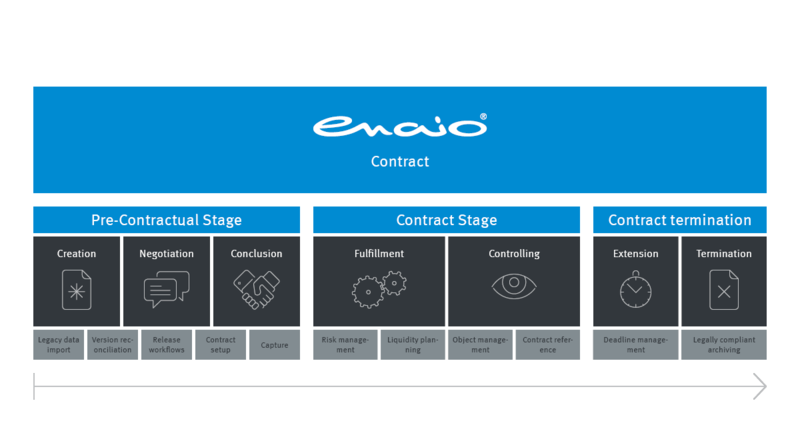 enaio® can be specifically adapted to the requirements of your organization and the contract management you want. The standard version delivers all basic ECM functions. If you need added functionality, there are a variety of enhancement options, for example, for creating contracts, optimizing contract processes, or working with contract data in ERP systems. Digital Contract Management at the Valora Group - The key objectives were to standardize corporate processes and gain improved transparency as well as minimize risks with regard to contractual terms. Introducing this solution has made a huge difference. There is no other way of putting it! We can’t imagine doing without it. Our users readily accepted the contract record because it is easy to see which contracts are about to expire. They are stored in a central location rather than with the respective central or divisional manager, as was the case before.